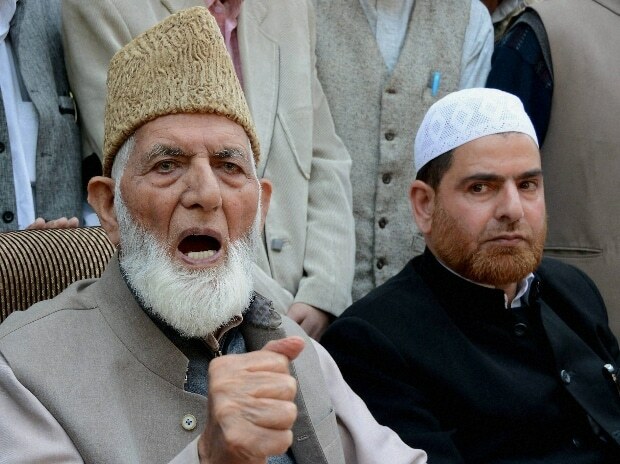 The NIA has summoned moderate Hurriyat Conference chairman Mirwaiz Umar Farooq and the son of pro-Pakistani separatist leader Syed Ali Shah Geelani for questioning in Delhi in a terror financing case, officials said on Saturday. According to a notice served on them, the Mirwaiz and Naseem Geelani have been asked to appear at the National Investigation Agency (NIA) headquarters in New Delhi on Monday, the agency officials said. The NIA had on February 26 carried out searches at premises of separatist leaders, including the Mirwaiz, in connection with the case related to financing of terrorist and separatist groups in Jammu and Kashmir. The houses of Jammu Kashmir Liberation Front (JKLF) leader Yaseen Malik, Shabir Shah, Zaffar Bhat and Masarat Alam were also raided. Barring the Mirwaiz and Sehrai, all other leaders were jailed for some time. The NIA had questioned two maternal uncles of the Mirwaiz -- Maulvi Manzoor and Maulvi Shafat -- and his close aides last year. Both Manzoor and Shafat are retired senior government officers. The case names Hafeez Saeed, Pakistan-based chief of Jamaat-ud-Dawah (JuD), the front for banned Lashker-e-Taiba, as an accused, besides organisations such as the Hurriyat Conference factions led by Geelani and the Mirwaiz, Hizbul Mujahideen and Dukhtaran-e-Millat.